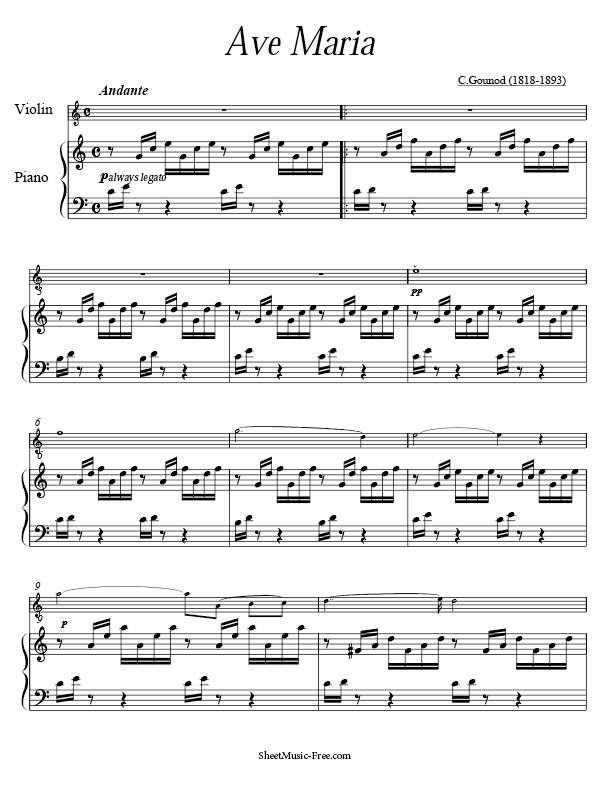 “Ave Maria Gounod Sheet Music” by Gounod, “ Ave Maria Sheet Music” for Piano / Violin , Original key: C Major, number of pages sheet music PDF: 4, Video Piano Cover song Ave Maria Gounod Sheet Music. “Ave Maria Gounod Sheet Music’” is a popular and much-recorded setting of the Latin text Ave Maria, originally published in 1853 as Méditation sur le Premier Prélude de Piano de S. Bach. The piece consists of a melody by the French Romantic composer Charles Gounod especially designed to be superimposed over the Prelude No. 1 in C major, BWV 846, from Book I of J.S. Bach’s The Well-Tempered Clavier, written 137 years earlier. Ave Maria Sheet Music Gounod. Gounod improvised the melody, and his future father-in-law Pierre-Joseph-Guillaume Zimmermann transcribed the improvisation and in 1853 made an arrangement for violin (or cello) with piano and harmonium. The same year it appeared with the words ofAlphonse de Lamartine’s poem Le livre de la vie (“The Book of Life”). In 1859 Jacques Léopold Heugel published a version with the familiar Latin text. The version of Bach’s prelude used by Gounod includes the “Schwencke measure” (m.23), a measure apparently added by Christian Friedrich Gottlieb Schwencke in an attempt to correct what he allegedly deemed a “faulty” progression, even though this sort of progression was standard in Bach’s music. Alongside Schubert’s Ave Maria (another contrafactum), the Bach/Gounod Ave Maria has become a fixture at wedding masses, funerals and quinceañeras. There are many different instrumental arrangements including for violin and guitar, string quartet, piano solo, cello, and even trombones. Opera singers, such as Franco Corelli and Luciano Pavarotti, as well as choirs have recorded it hundreds of times during the twentieth century.